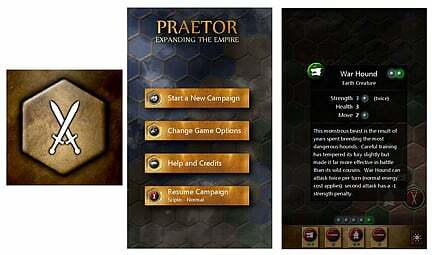 In the spirit of classic role playing board games, Random Software Games is offering the Windows Phone 7 game Praetor. Praetor is a RPG board game that relies more on strategy than flashy graphics (not that flashy graphics are a bad thing). The storyline goes that you, a member of the Roman Army, are shipwrecked on an island far from the heart of the Roman Empire. You command what remains of your troops to explore the island and conquer what you can. Characters and equipment in this turn based game are represented by a colored disc (with appropriate symbol). Praetor allows for character name customization (default name is Scipio) as well as character paths (warrior, sorcerer, etc). You also have a choice of what color/style game piece you'll be using. The game is well narrated and has a rather appealing, nostalgic look to it. All that is missing is a a pair of die. When you first start playing Praetor, a tutorial will guide you through the first few moves. As you progress through the game you will earn more strength and skills that will help you conquer the land. Game play is decently paced and full of challenges. You get to battle wild boars, war hounds, and other vicious creatures. If you like strategy, role-playing board games Praetor is worth looking into. There is a free trail version available and the full version runs $.99. Both can be found here (opens Zune) at the Marketplace.